This sandwich is an excellent breakfast for younger children, teenages and sportmen. Calorie count of this sandwich is about 180kcal. It is very quick to prepare. What you need is just 5 minute in the morning to get it served. 1) Cut the edges of breads. Spread a thin layer of butter or margarine on bread. 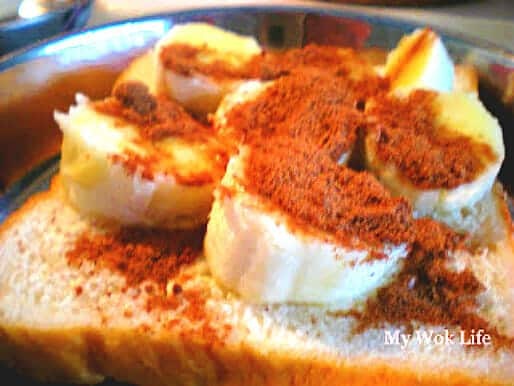 2) Slice banana, and layer on 1 bread. Sprinkle Milo powder on top of the banana slices. Condensed milk as dressing to be topped over banana slices and Milo powder, if desired. Place 1 bread tops over fillings. Serve. If you prefer something warm and crispy, make this sandwich a toasted one. I personally prefer toasted version. The bread became crispy, and the heated banana turned soft and warm in the palate. 3) Follow the above 1) and 2) steps. 4) Place whole sandwich on the bread maker. Serve warm when it is ready. The toast sandwich is best to consume it warm. It can be served as snack or tea time. Tips: Add some condensed milk, if desired. Tops over banana and Milo powder, before placing another bread. Taste will be even better with some condensed milk. wah sounds heavenly for children but I wouldn’t eat it myself! BREAD + BANANA + MILO + CONDENSED MILK = sugar + CARBO = me FAT!